I did ALOT yesterday. I was able to replace almost all of our commonly used items for those made with known ingredients and I couldn’t be more proud that my home is becoming a more “green.” If you’re not interested in all the recipes. . skip down below. I’ve learned some other lessons too. The frugal lady in me is having a hard time throwing out full bottles of the purchased products. Although I really don’t want to use them and continue breathing the fumes, I still can’t toss them. So, I’ve pushed them to the far reaches of the cupboard, for now. Perhaps next spring, while spring cleaning, I’ll convince myself to throw out anything I haven’t used in a year and that’ll be my permission. 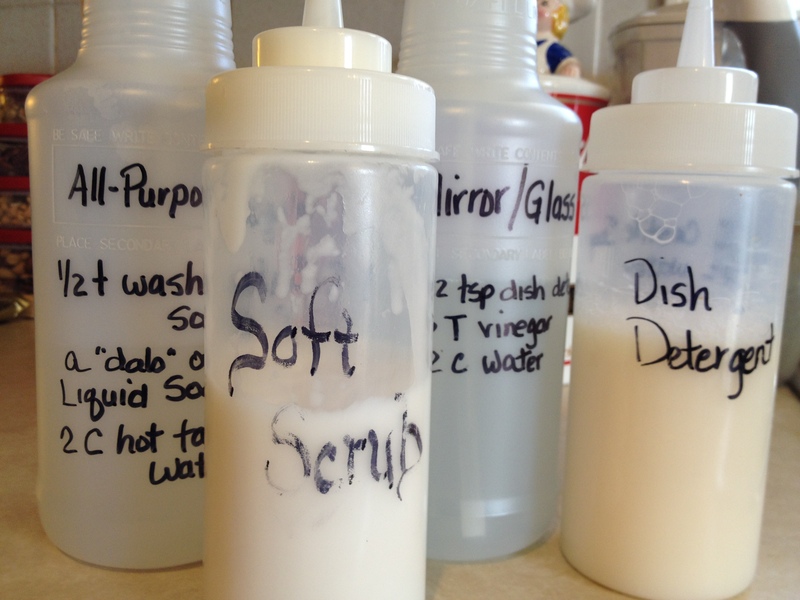 The other realization during yesterday’s lotion and potion spree. . all these new cleaning products are so easy to make, with regular things in my pantry, I should never run out. I just make more. I’m also surprised at how little of each ingredient I used. Seriously. . I was a little worried, spending so much on a bottle of tea tree oil, but when I’m only using 10-15 drops at a time, it should last quite awhile. So here we go with the cleaning solutions. . . I went to Sam’s Club and purchased a package of 6 spray bottles and 6 condiment-type bottles. One of the spray bottles has a “foaming” nozzle on it. I will use that one for tub and shower cleaner (which I’m still researching a few “foaming action” recipes. I used a Sharpie to write on the bottles, but since I’ve used the bottles and gotten the solutions on the outside, some of it is wearing off. I’ll come up with something more brilliant and share it when I do. I’m using Desert Essence Castile Liquid Soap with Eco-Harvest Tea Tree Oil. I chose this over Dr. Bronner’s because this soap does not have SLS. I know there are competing versions of whether Sodium Laurel Sulfates cause cancer or not. . I’m not willing to find out. I’m also, quite frankly, a little put off by all that writing on the Dr. Bronner’s soap. I don’t have the time, while shopping, to stop and read it all and if I’m being deliberate about things, I’m not going to buy something that I don’t understand. So, Desert Essence earned my dollars this week. To make this, place the baking soda and glycerin in a mixing bowl. Keep adding the liquid soap until it resembles frosting. . or any other soft scrub product you may have used in the past. That’s it. Pour it in a bottle and clean away to your heart’s content. I used this yesterday on my sinks, a cooked-on spot on my ceramic cooktop and to get some printing off one of the bottles when I changed the recipe. It worked really well. I made one to keep under the kitchen sink, the upstairs bathroom and our bathroom. This concoction had some fun to it. Instead of “dish detergent” I used liquid castile soap. When I added the vinegar. . hilarious. The vinegar seems to separate the “soap” from the rest of the liquid. I had this little glob of stringy soap floating on top. . so, back up and try again. The second time, I used some of the generic blue dishwashing detergent I had left. It worked fine and since it’s such a small amount, I think I can live with it. You can also make this recipe without the dish liquid, which I’ve done, but I thought I’d see how this works before I leave it out the next time. Washing soda is completely different from baking soda, although I’ve seen some recipes with either of these two items listed. I bought Arm & Hammer washing soda in the laundry aisle at the grocery store. It wasn’t that expensive and as you can see, you don’t use much in these recipes. I will be using it to make laundry detergent later and I used it last night for dishwasher detergent. The “dab” of liquid soap made me laugh. I don’t know how to measure that so I just slowly tipped the bottle until some came out and quickly pulled it upright again. I’m sure someone, somewhere knows what a “dab” is. It’s probably related to a “pinch”. I’ve also put this solution in the two bathrooms upstairs and in the kitchen. I used it last night on the counter tops as I cooked and on the kitchen table. It works well and I added a few drops of tea tree oil in it, of course. I love that stuff! Next: Dishwashing liquid Uh-oh. . I can’t remember where I got this. If you originally posted this recipe and I’ve blog-lifted it from you, please send me a comment, I’d be happy to credit you with this. Remember what I said before about soap and vinegar? In this solution it seems to work. The soap is an amber color and when I added the vinegar, it “flowered.” I don’t know how else to put it. As the vinegar moved through the soap it turned white. . really interesting to watch. I used tea tree oil again, thinking my whole house should just have that and lavender scents. That way I don’t muck it up with too many flavors. I used this last night, as well, while cleaning up after dinner. It works very well and my hands didn’t feel chapped and dry after using it. Just mix all these ingredients in a tightly sealed container and use 1-2 Tbl per load. She suggests keeping a silica packet in the container to keep the product from clumping up, due to moisture. For a rinse aid, just pour some vinegar into the bottom of the dishwasher before you close the door. I used this last night as well and am pleased with the results. We still had some spots on the plastic wear, but not nearly has bad as before. The spots I’d been having almost feel like a soap residue and these were just water spots and wiped off easily. On to something I’ve thought about these past two days. . the spiritual version of all this deliberateness. I’ve made quite an effort to replace things in my home that have been toxic to me and my family. There are some chemicals which we breath, absorb through our skin or attach to our dishes and utensils which cause harm. This happens so subtly over such a long period of time that we never notice until one day, we’re told we’re sick or have cancer. Then there are other things, we know are unhealthy, yet we choose to partake anyways, thinking that. . cancer, heart disease, high blood pressure. . that only happens to someone else. “I’ve eaten this my whole life and I’m fine”, and then suddenly you’re not. The same sickness happens to us spiritually. We participate in unhealthy conversations or relationships and don’t realize the damage is taking it’s toll. We allow a hurtful remark or joke to grow inside us like a cancer, making us bitter and angry and finally we give up on people. We are afraid to reach out and help someone because of what happened last time. Sometimes it’s subtle other times, we know it’s not healthy and we choose to participate anyways. . just this once. Do I make the same effort to rid my spiritual life and home of toxins as I do my physical life? Do I make the same efforts to rid my life of pettiness, bitterness, anger, fear? Do I try to make substitutions that are equally as dangerous or do I just push them to the back of my “cupboard” and wait a year to throw them out? No, I will be deliberate in asking Christ to help me make these changes in my heart as I make them in my home. I need to replace those toxic things in my life with healthy NEW things. Where do I find such recipes? Not online, certainly. God has the recipe book. This is the beginning of a long, healthy journey for me. . all of me. .toward wholeness. Have a good day. . be deliberate! Thanks Deanna! I’d love to hear some of your “cleaning” ideas. Thanks for you comment, I look forward to hearing from you again! I love the second half of this post! I’m right there with you. The funny thing is, God sort of cleaned out my spiritual cabinets without my realizing it. As I grow closer to Him, I see other friendships fade away. It’s not that they are bad friendships, but they aren’t maturing my spiritual growth. I still hold those friends dear, but the relationship has simply changed. He did the same thing with my job — taking me from an environment lacking in faith and placing me in one where my immediate co-workers are on my level. It’s been amazing to take a step back and watch. I love this post, love! He is amazing.